Put the grill pan on the stove and let it heat up for a few minutes. Add olive oil and grill the mushrooms on both sides until grill marks emerge. To build the hamburgers, stir the goat cheese and spread 1 tablespoon on 1 of the slices of the hamburger bun. Add 1 leaf of lettuce in place of the hamburger, along with two slices of avocado and a slice of tomato. Finally, add the Portobello mushroom and season with salt and pepper, to taste. Try ciabatta bread in place of hamburger buns. I am a super fan of mushrooms and I use them in my kitchen for many recipes. One of my favorites is the Portobello mushroom. It has delicioso flavor and a meaty texture which make this particular mushroom an excellent ingredient for those of you seeking vegetarian options, or to replace meat with veggies. 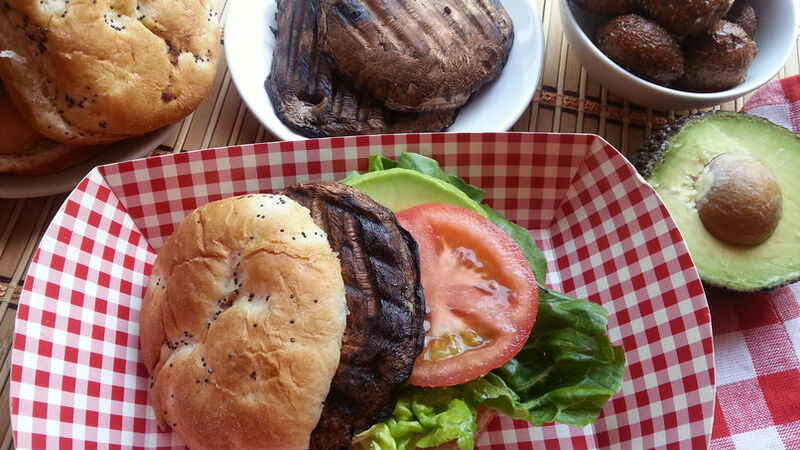 For this reason I want to share with you my grilled Portobello hamburger; an option that is one of my family’s favorites. Let's cook!